(MoneyWatch) Apple (AAPL) announced revenue of $54.5 billion and earnings of $13.1 billion, or $13.81 per diluted share. Sales were up 17.7 percent from the same period the previous year, while profits were flat. Analysts had forecast revenue for the period of $54.7 billion and earnings of $13.44 per share. Investors had been concerned because in the previous quarter profits missed analyst expectations and recent reports suggested that sales of the iPhone 5 were slowing. "We're very confident in our product pipeline as we continue to focus on innovation and making the best products in the world," Apple CEO said in a statement. 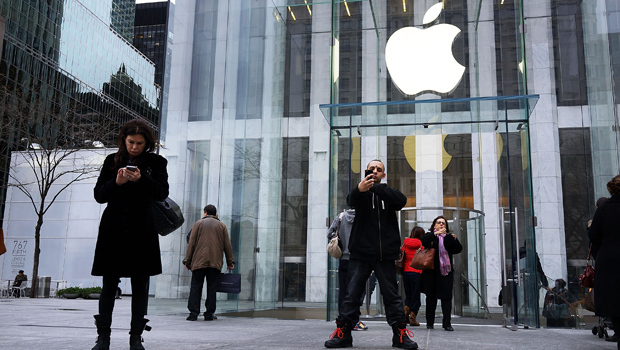 Is Apple signaling a bad quarter? Is iPad mini cannibalizing its bigger sibling? Apple said it sold 47.8 million iPhones last quarter for total revenue of $30.66 billion, or $641 per phone. That slightly exceeded analyst expectations of 46 million to 47 million unit sales. In the previous quarter, Apple sold 26.9 million iPhones for sales of $17.13 billion, or $637 per phone. The iPhone is vital to Apple, with the highly profitable device driving the company's overall financial results. A recent Wall Street Journal report stirred talk that Apple had significantly reduced orders for iPhone parts, possibly because consumer demand was lower than the company internally forecast. Sales of handsets running the competing Android platform from Google ((GOOG) have continued their strong growth. Apple reported 22.9 million iPad sales for revenue $10.67 billion, with an average sales price of $466 per unit. In the previous quarter, Apple sold 14 million iPads, generating revenue of $7.51 billion at an average of $536 per unit. A Reuters report suggested that the iPad mini was cannibalizing sales of the full-sized versions. That could explain the significantly smaller average unit sales price for the quarter and more than $2 billion in revenue had Apple been able to sustain the higher unit price. In after-hours trading, investors pushed shares of Apple down more than $50 to $463.39, a loss of nearly 10 percent.